At the annual Utah Valley Business Awards luncheon, the Chamber recongnizes outstanding businesses in Utah Valley. 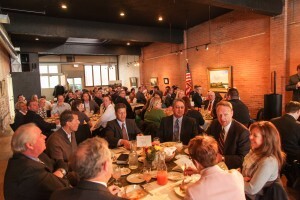 It is also the annual meeting of the Chamber and installation of the Board of Directors. Sponsorships for the Business Awards allows your business to be recognized among the top businesses in the Valley. 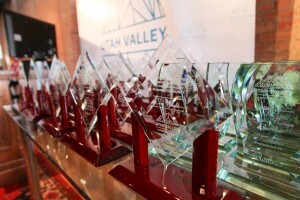 If you are interested in sponsoring the Business Awards, contact John Whittaker at jwhittaker@thechamber.org or by phone at 801-851-2563.
doTERRA INTERNATIONAL, LLC (www.doterra.com/us/) was the Utah Valley Business of the Year for 2013. Other Business Award winners were J Dawgs (www.jdawgs.com), Small Business of the Year; IM Flash (www.imflash.com), Innovative Business of the Year; Swagger Card (www.swaggercard.com), New Business of the Year; and Fishbowl Inventory (www.fishbowlinventory.com), Community Partner. Jared Morgan, Executive Director of Downtown Provo Inc., was chosen as recipient of the Rising Star Award, and Elaine Porter, CEO of Landmark Catering, was named Business Person of the Year. The businesses and individuals will be honored at the Chamber’s annual Business Awards and Installation Luncheon on January 29 2014.
dōTERRA INTERNATIONAL is a world leader in the sourcing, testing, manufacturing, and distribution of pure, therapeutic-grade essential oils and oil-infused personal care and spa products, dietary supplements, and healthy living products for the home. dōTERRA has several hundred thousand consumers and consultants around the world that are supported by offices in Utah, Japan, Taiwan, South Korea, Hong Kong, Australia and Europe. The company is building a new corporate headquarters in Pleasant Grove, Utah, with scheduled completion in the summer of 2014. J dawgs is a hot dog restaurant located in Provo, Orem and American Fork. The hot dogs enjoy a cult-like following, especially among the college crowd, and are known for their special sauce. Established in 2004 by Jayson Edwards in a small shack south of BYU, the company has experienced significant grown each year. IM Flash in Lehi creates flash memory and does it better than any other semiconductor company in the world. Smartphones, cameras, tablets or laptops depend on flash memory to capture and store the information we use every day. IM Flash, an Intel and Micron company, has achieved staggering success in eight years. IM Flash entered the flash memory market as an unknown – competing against giants such as Samsung and Toshiba for market share – but quickly became the world leader in technology design within three short years. IM Flash was recently awarded 'Semiconductor of the Year' beating out all other semiconductor players in the industry. Swagger Card is a custom discount card that each individual builds by picking 12 deals to their favorite places for food, shopping, and entertainment. Customers get unlimited use to their favorite deals for one year! The company helps organizations accomplish their fund-raising goals. The company has been involved locally with BYU and UVU and the Chamber of Commerce. Fishbowl Inventory is a private company in Orem that is the No. 1-requested inventory solution for Quickbooks. The company and its CAM Foundation are very involved in the community. Working with the Warriors of Light, UVU and Certiport, the CAM Foundation offers free online courses to qualifying individuals and also offers an online Small Business Resource Center to assist small businesses. The company also is partnering with the new Living Planet Aquarium in Draper. Jared Morgan is the Executive Director of Downtown Provo Inc. and has been working to spearhead the revitalization of the downtown Provo area. He has played an instrumental role in working with Provo City to build up the music scene with the rooftop concerts and other venues. Elaine Porter and her husband, Hal, have run Landmark Catering in Utah Valley for the past nine years. They have built their business by referral only and now have many clients ranging from corporations to special events.